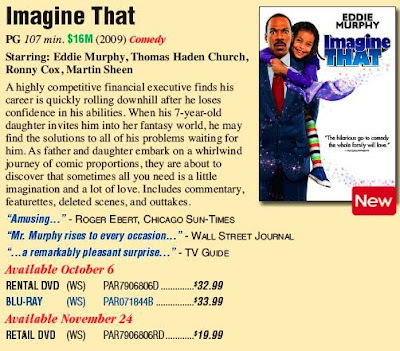 As Paramount experiments with their two-tiered pricing model, they’ll release a rental edition of Imagine That (stock #: PAR7906806D) on October 6, 2009, which will feature the theatrical edit of the PG-rated film. This higher-priced edition will not be available in retail stores and is meant for video rental businesses. Because availability is limited, please pre-order this edition as soon as possible. Paramount will also release a retail edition of Imagine That (stock #: PAR7906806RD) on November 24, 2009, which will feature the same PG-rated theatrical edit of the film as the rental edition. However, this lower-priced version will hit retail outlets nationwide approximately seven weeks after Paramount releases the Blu-ray and rental editions. Therefore, customers who order this item will not receive it until the retail release date of November 24, 2009. If you have any questions about the differences between available editions of Imagine That, please post them here as comments or contact our Customer Service Department at 1.800.875.2785.